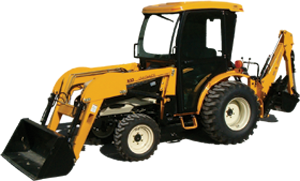 All steel and glass one-piece welded constructed cab that does not meet ROPS requirements. Cab is not ROPS certified, but sits in front of the existing, un-modified factory ROPS. Front windshield includes wiper motor assembly. Rear window swings open for better ventilation. Cab height is 63 inches, measured from the platform floor.